Provizr was founded by 3 industry veterans who spent their careers advising clients on retirement. 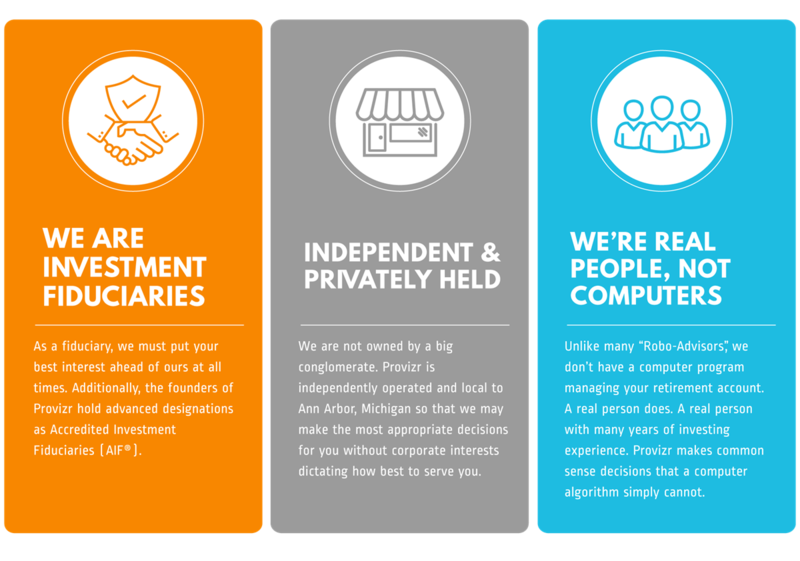 Based in Ann Arbor, Michigan, we have met with many university employees who share a common experience - their retirement program was too confusing. Many employees simply choose random investment options, hoping for the best. They didn't know how to manage their portfolios when the markets or economy changed. Even if the employees worked with other financial advisors, they were hesitant to offer actual advice, and almost none could manage both the university Fidelity and TIAA retirement account for the employee. We realized that there were far too many people that were in this situation... and we set about to do something about it. Provizr is an investment advisory firm solely focused on helping university employees and retirees. We are professional financial advisors with the ability to provide active management of both your university Fidelity and TIAA retirement accounts, but more than that we are passionate individuals who love our work. Our success in the financial field allows us to offer a unique solution - true financial guidance. Are you looking for advice on setting up your initial investments? We can give you personalized advice. Looking to see where your investment strategy stands? We offer a number of self-guided tools to help you navigate your financial strategies. Are you hoping to set up your own business someday? We did the same and we are happy to give you our thoughts on small business financial management - all of this at no obligation and no charge. Long-term tactical portfolio planning can be overwhelming. We understand life gets busy, and many don't have the time to devote the attention needed to managing retirement accounts. We know what it takes to retire comfortably. Provizr can help you define your retirement vision, guide you in assessing risks that fit your comfort level, customize your investments, and maintain your portfolio for you throughout the years. We offer hands on professional management of your Fidelity and TIAA 403b university retirement accounts at a reasonable and transparent fee. Using sophisticated strategies, we analyze the markets, place the necessary trades, and monitor your account to help you work toward your retirement goals. You deserve more time, better help, and most importantly, a chance to live out your retirement dreams. Simply connect with us and we can provide you with whatever assistance you need - no strings attached.